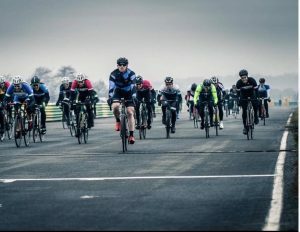 Bike Racing In Yorkshire, Ravensthorpe Cycling Club. Racing in cycling can be the pinnacle of a cyclists career and experience of the sport. The ability to race takes training, patience and determination to win. Present members include our very own Brian Robinson, who was the first Brit to finish the most prestigious cycling race, Le Tour de France, as well as being the first Brit to win a stage. So if you’re thinking of trying your hand at racing, or need some advice. You’re in the right place! Shane Pollington secured his first ever win racing for the club – cracking performance clocking up 30mph on the final sprint! There were 4 Thorpers racing including Wayne Corey, Andy Pitt and Max Burt. We currently hold club events including 10 mile, 15 mile, 25 mile and 50 mile Time Trials with the prestigious “1895 Tradesmans Trophy” awarded to the 25 mile handicap.